The versatile Ashville planter collection showcases quintessential time-honored design with simple clean lines and clear-cut form. The paneled design on these square and rectangular planters brings charm that is simply timeless. 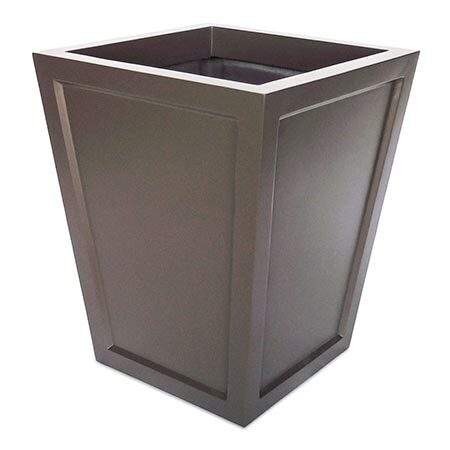 And speaking of staying power, these lightweight outdoor planters are crafted from the highest quality fiberglass material to resist molding, cracking, warping, and fading for many years to come. In a variety of sizes, these container garden boxes are ready to display anything from floral arrangements to ornamental trees. Customization options are nearly endless, so you’ll have no trouble incorporating these planters into your business landscape or home front porch. Choose from over 20 colors and four attractive finishes, plus color matching available on request. There’s a reason why traditional designs have lasted throughout the ages; they have a simple, elegant beauty that appeals to everyone. Our Ashville fiberglass planters are no exception to this rule. They feature a time-honored design that has been around since the Romans were carving garden planters out of stone. Taking a page out of the history books, these lightweight fiberglass planters display a recessed panel design on all four sides (double paneled on the larger Rectangle and Square planters). With the simple and sophisticated Ashville planter box you get a functional and decorative container garden planter that will fit in with virtually any type of decor and meet all of your practical needs. From hotel atriums to shopping malls to your own humble front yard, these well-loved planters are ready to complement any space. The beauty of our versatile fiberglass planters is that they can be customized in so many ways to meet anyone’s decorative needs. Just because these large outdoor planters embody a classic design, it doesn’t mean that you can’t jazz your own planters up for a more non-traditional modern look. We offer a wide variety of color choices in matte, semi-gloss, gloss, and sand finishes to meet your style sensibilities. For example, you can customize the more contemporary Tapered Rectangular and Tapered Square planters in blazing Persimmon orange or Metallic Silver to bring a pop of color to your landscape. We can even color match on request. And if you want to keep the traditional vibe alive, then why not opt for a handsome faux stone sand finish? At a fraction of the weight and ten times the durability, these innovative fiberglass planters can be custom crafted to mimic real stone, wood, or metal. Incorporate the perfect site furnishings for a Tuscan-themed casino courtyard or old-world European restaurant dining patio by filling these planters with manicured topiaries and trailing vines. Straight-sided or tapered, you’ll find the Ashville planter boxes in a variety of sizes to meet any design parameters. From small front porch planters to jumbo sized tree planters for a business park, these durable fiberglass planters boast both beauty and strength. Prolific root systems, heavy foot traffic, and freezing temperatures are no match for our long-lasting plant boxes. A natural resistance to rot, insects, cracking, warping, and fading ensures that these old-fashioned planters will last long into the future.